"When your child is diagnosed with cancer, your life stops, changes course, and begins instead toward a path to do anything & everything to help your baby." Santiago was born on September 19, 2009 in San Diego, CA. At his two-year check-up, Santiago's mom, Irma, mentioned to his doctor that she noticed a white light reflected in his eye whenever his picture was taken. "I thought Santiago could be color blind or needed glasses" said Irma. "I never imagined it was cancer." 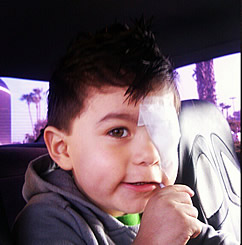 But, on September 30, 2011, two-year old Santiago was diagnosed with unilateral Retinoblastoma. "There were two treatment options for Santiago; remove his eye and possibly receive full body chemotherapy or intra-arterial chemosurgery. I decided to proceed with the chemosurgery." Unfortunately, the doctors in San Diego were not properly trained in the procedure so Santiago was referred to New York City-Memorial Sloan Kettering Cancer Center. Irma, a single mom, scraped together the necessary funds to pay for their flight. The doctors' knew he urgently needed treatment but the procedure was repeatedly delayed by the insurance company. The wait became a month and Santiago's cancer was growing, putting his life at risk. Irma learned from one of the New York doctors that the University of California San Francisco (UCSF) offered the chemosurgery, but without the same experience level as Sloan Kettering. Due to the fact Santiago had California insurance, she decided to head to San Francisco and pray the doctors were experienced enough! Irma wanted to leave for San Francisco immediately but couldn't afford the flight. It was during this time she discovered NCCS. "I sent in the paperwork as soon as possible to see if they could help. And they did," said Irma. "The next thing you know we were on a flight to San Francisco and Santiago had his first IAC." Follow-up exams showed the chemosurgery was effective - his cancer shrunk and he was scheduled for a second treatment. "During our trips from San Diego to San Francisco, NCCS became our angel. The organization helped with travel, meals and taxi expenses. The assistance they provided was invaluable; it alleviated a big part of the stress and made it possible for me to fully concentrate on my son's health," said Irma. Unfortunately, Santiago suffered complications after the second treatment and doctors recommended removing his eye to give him the best chance of being cancer-free. Irma is happy to report Santiago is healing very nicely. "He seems much happier and active than when he had the cancerous eye with him. Santiago is one of a kind trooper with the strength of a warrior and the heart of an angel," said proud mom, Irma. "I thank God for the wonderful help he sent our way through The National Children's Cancer Society, because without them, we would not be financially able to get Santiago to his treatment. Thank you NCCS and God bless."